Two Toronto-based companies have teamed up to try to make building key cards and password-required workstations a thing of the past. Nymi, a smart wristband that uses biometrics as a means of identity authentication, has partnered with identity management firm Entertech Systems to bring logical and physical access control to office environments. The Nymi Band will be equipped with Entertech’s BioConnect, an enterprise identity platform, to allow wearers to use their unique heartbeat to confirm their identity rather than relying on name badges or key cards. And Rob Douglas, founder and CEO of Entertech, notes the move away from this out-of-date technology makes sense when you consider there’s around half a billion doors, safes, server cabinets and other secured locations around the globe that require some form of identity authentication. When paired with BioConnect, Nymi wearers can simply flick their wrist to access terminal to open the door to their office, a server room or a variety of other secured locations. 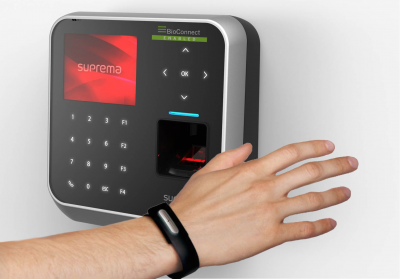 The wristband is NFC-enabled, which means users can open doors with a quick tap on an enabled Suprema reader. And the BioConnect platform acts a translator for the terminal, sending a signal that this is in fact the right person based on their heartbeat. In addition to accessing physical locations, the Nymi-Entertech partnership means workers don’t have to remember their computer workstation password (or remember to change it every 90 days). Users can open the Nymi Lock Control app to unlock their Mac or PC without entering a PIN or password. To test the efficacy of the platform and band working in tandem, the two tech firms have launched a pilot program with several undisclosed companies around the Toronto area that were existing Entertech clients. While the companies span a variety of industries, Chance and Douglas are expecting to glean a wealth of findings from the participants as they test out the wearable tech. “Our objective at the other end of [the pilot program] is to be able to verify and say here are the common use cases where this solution can have great benefit to the future of the enterprise and the employees as well,” says Douglas. As for future features spawned from the Nymi-Entertech alliance, Chance says they’re already thinking beyond simply unlocking doors. This isn’t the first time startup Nymi has introduced a new device function this year. In recent months, Nymi has also unveiled several other new features for its take on wearables, including biometrically authenticated mobile payments and two-factor authentication tokens.